This is what people talk about when they say they hate January. This. Today. Most of this damn week. Gray skies and crabbiness. Short days and no more Christmas. Yuck. It’s the worst. So many terrible things have happened today. And it is all January’s fault. First, I made us Blackberry Farm’s griddle cakes for breakfast. With bacon and blueberries in them! It sounded like the most tasty thing in the world! Thin cornmeal pancakes with a touch of salt and sweetness. Yum! But then it wasn’t perfect. It wasn’t yum. They were dry and a little strange and not at all flavorful like I thought they would be. I also subbed different flours for 3 out of the 4 flours and that probably has a ton to do with it. While making the anti-climatic crappy Saturday breakfast, Mr. Carrot and I got in a stupid useless fight about absolutely nothing that ended up evolving into a bigger fight about non-useless things and we wasted four hours of a perfectly good morning talking about emotions. The moral of which was “don’t be mean” (directed at me, of course, because sometimes I’m a massive mean-spirited brat). Oops! My Carrot man tried to keep the fire stoked during a break in the discussion and sliced his Carrot knee with the tip of his Carrot axe. (Don’t worry, no stitches necessary). But ouch! And then, then(! ), in the midst of it all I dropped a frying pan on my shin (don’t ask how) and it was the most phenomenal pain I’ve experienced in quite a while. January. I tell you. It’s the worst. Post stupid married argument, I wanted to make something sweet to take our minds off of everything. Something happy and silly would totally reset the day. Hot chocolate cupcakes with a marshmallow frosting sounded perfect! So happy and blissful and wonderful! But we didn’t have marshmallows, and homemade marshmallows (which sounded like maybe just the ridiculous adventure to snap me out of my crabbiness) need 2 packets of unflavored gelatin and who has that stuff just lying around?!!? How absolutely terribly discouraging. So no homemade marshmallows. No hot chocolate cupcakes. So I drank three cups of coffee spiked with hot chocolate mix and mini marshmallows. That got me somewhere closer to happy. And then I read Ottolenghi for hours and took a two-hour nap with my dogs and made this (pictures above, recipe below) instead. I’ll defeat you yet stupid crappy crabby January! Melt the butter in a small saucepan over medium heat. Let it simmer, sizzle and pop to release all of the water. This will take about three minutes. Let it keep going until it stops sizzling, stirring occasionally and scraping up any brown bits from the bottom of the pan. Remove from heat. Add chocolate chips. Stir until smooth. Set aside until cooled to room temperature. This should take about 10 minutes. Prepare 8” spring-form pan by lining it with circle piece of parchment paper and buttering entire pan well. Set aside. In a large bowl, combine egg yolks, brown sugar, vanilla extract and ¼ teaspoon salt. Use Kosher if you don’t have sea salt on hand. Whisk for 2 minutes until it turns an ugly pale yellow and gets pretty thick. 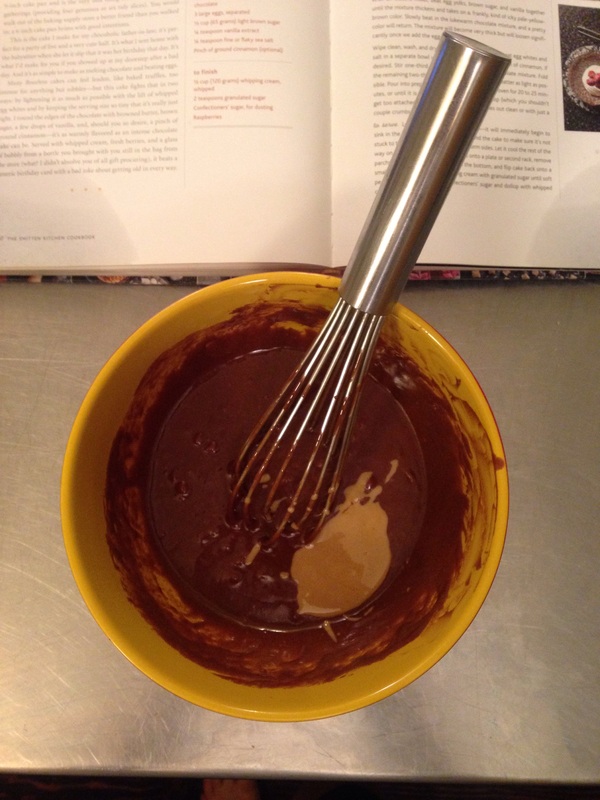 Add in cooled chocolate mixture and tahini. Stir until well combined. It will be quite stiff at this point. That’s perfect! In a mixing bowl, combine egg whites and remaining ¼ teaspoon of salt. 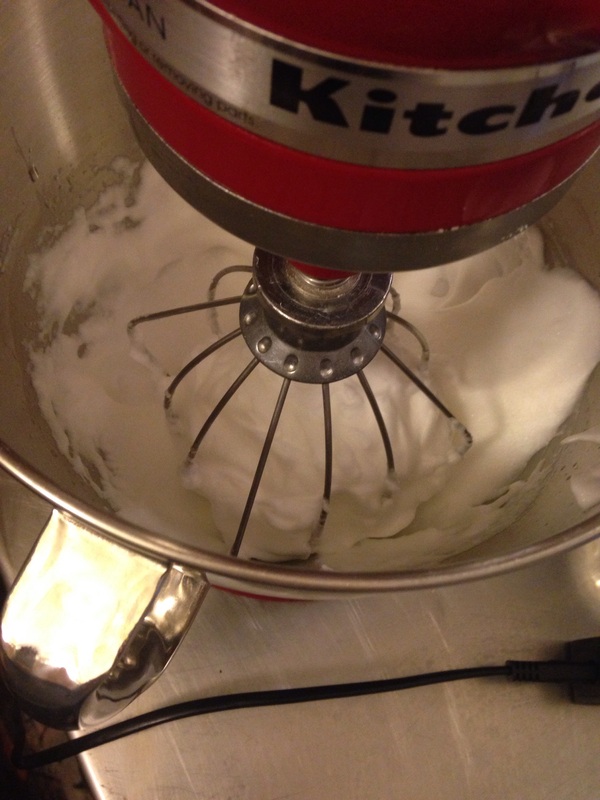 Whisk at a high speed until stiff peaks form. 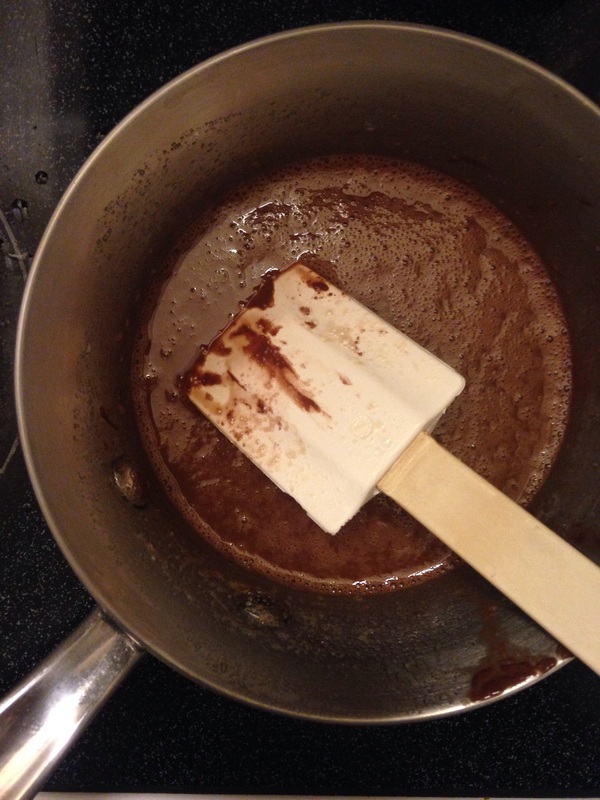 Add 1/3 of stiff egg whites to chocolate mixture. Fold in gently. Add remaining egg whites and fold in gently, keeping the batter as light as possible. 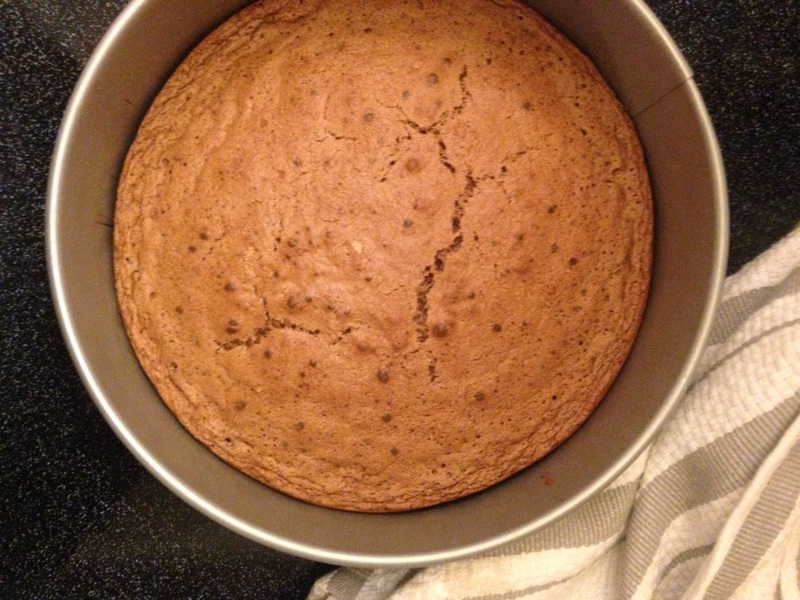 Put cake batter in prepared spring-form pan. Bake in preheated oven for 25 minutes until puffed up (don’t get attached to this; it will sink). Remove from oven and let cool for 10 minutes. Remove from pan by flipping upside down on a plate and flipping back onto serving platter. Try not to move it with a spatula. It will fall apart. This cake is extremely delicate. But if it breaks it will still taste delicious! Prepare whipping cream by combing honey and whipping cream in mixing bowl. Whisk on high for 2-3 minutes until stiff. 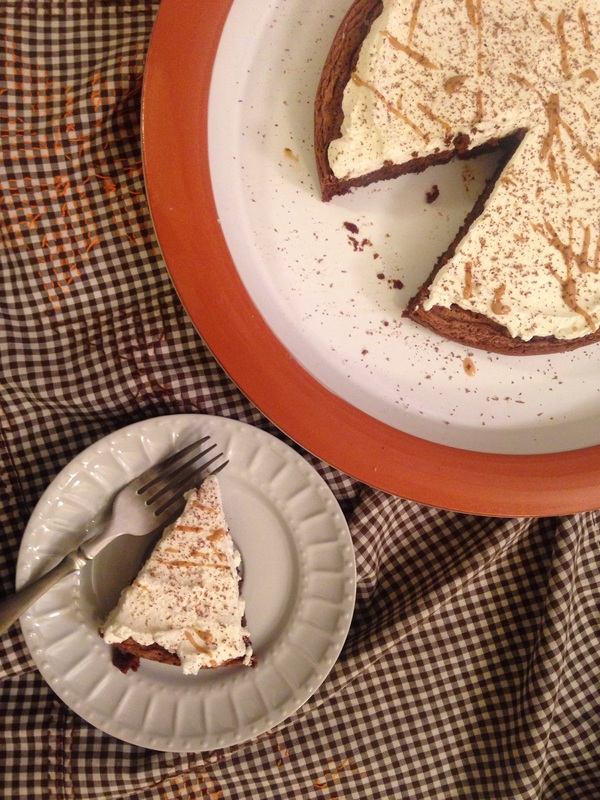 Spread over cooled cake and garnish with tahini drizzle, chocolate shavings and more salt.